This colorful, lightweight aluminum walker with wheels folds easily. Adjustable walker includes 5" dia. wheels and rubber tips for rear legs. Walker height adjusts from 32"-39" with 16" between arms. Folds to 25" W x 4 1/2" D x 36" H for easy transport and storage. Lightweight walker weighs just 7 lbs. Supports up to 300 lbs. No express shipping. Every one comments how much they love the color. Purchased this item twice. Hoping the second item would last longer than the first. Broke again in the same place as the first one. Both lasted just past the warranty period of 45 days. I have another one I bought long time ago , but it does not work that well anymore , it was time to get a new one. Dad needs a walker with larger wheels than the one he is using now. pricing is good. it looks sturdy. I have a venous stasis ulcer on my inner right ankle for over a year. And it's very painful to the point that I cannot walk without some type of support. I also have heel spurs in the same leg so you can imagine what pain to walk without any support. I am very glad I bought this walker. looks light and folds easy. I wanted support as I walked around my garden. I am having trouble balancing and fell several days ago.. Now have a big bruise which could be far worse. I hope I will be more secure with a walker.. Need for new walker. Color was important to me. I have problems with my balance, and if I fall I'm unable to get back up on my own. For its light weight quality. It is very nice and easy to transport. My old walker is getting wobbly. I have poor circulation in my legs and have breathing problems so I need something to stabilize me when I walk. I choose it for myself to make it easier when/if I have to get up during the night. Is more secure then just a cane. I already have a relater 4 wheel style but I also have a need to be able to move about in the house now that I am more mobile than before. To help with getting around. The user is not ready for full wheel chair. 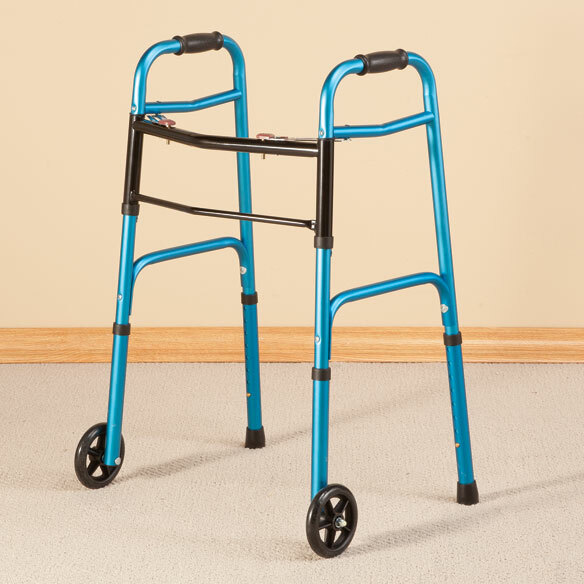 the walker looks sturdy and it comes in blue. Does this walker have the EZ Fold Up Feature or does it fold with one side over the other? what type of assembly is needed? BEST ANSWER: Thank you for your question. There is no assembly required. We hope this information will be of help to you. BEST ANSWER: Thank you for your question. The width on outside of handles is 19” and the width on outside of wheels is 24 ½”. We hope this information will be of help to you. BEST ANSWER: Thank you for your question. This item weighs 11 pounds. We hope this information will be of help to you. can wheels be added to the rear of the walker? BEST ANSWER: Thank you for your question. No, this walker is not designed to have wheels added to it. We hope this information will be of help to you. Sorry I don't know about wheels on the rear but tennis balls work wonderfully. Easy comfort has some the same color as the walker. No unless you have someone drill into the legs. It is not made to do that and the length of the legs would be affected as well. BEST ANSWER: Thank you for your question.Width between arms: 16". Width on outside of handles: 19". We hope this information will be of help to you. How wide is this item? BEST ANSWER: Thank you for your question. Open measurements (pins in the bottom hole): 23 1/2" W x 16" D x 32" H. Open measurements (pins in the top hole): 24" W x 16" D x 39" H. We hope this information will be of help to you. DO YOU HAVE A TRAY TO FIT THIS WALKER CATALOGENUMBER341726? BEST ANSWER: Thank you for your question. This is assembled and will just unfold. We hope this information will be of help to you. 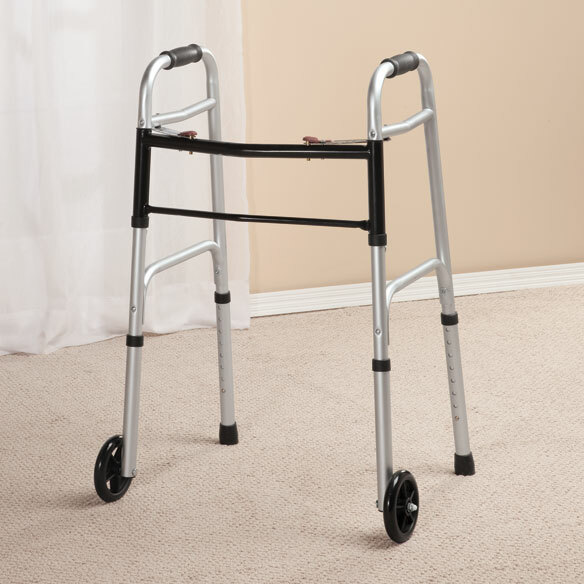 Can you use (4) of the "Walker Wheels 5" on this walker? BEST ANSWER: No 4 wheels, just 2 in back because there is no breaking on this walker. You stop by putting the front legs down on the ground and that stops the walker. If you had 4 wheeles there's no of stopping the walker and it can get away from you. Need walker for Mom but need to be able to access standard bathroom - small doorway. Will this fit? BEST ANSWER: Thank you for your question. For the Walker with Wheels when opened the width on the outside of the handles is 19" and the width on the outside of the wheels is 24 1/2". We hope this information will be of help to you.